It’s traditionally seen as a female sport but a new film proves synchronised swimming is for males too. 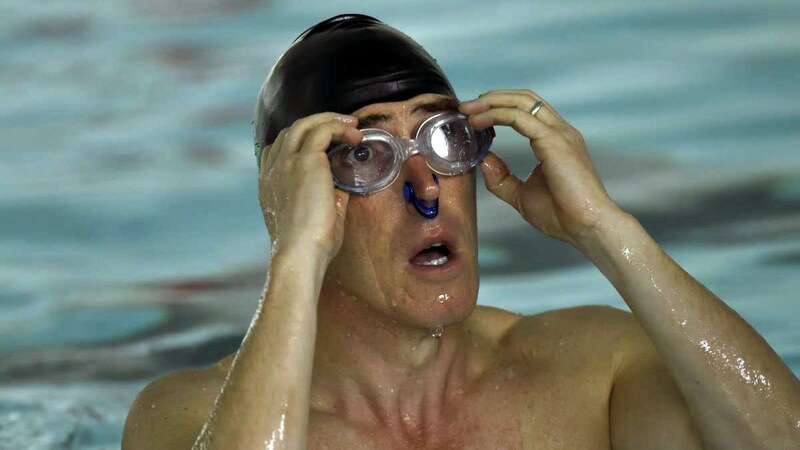 Ian Whadcoat spoke to Rob Brydon about his role in Swimming With Men. There was one thing that surprised Rob Brydon about synchronised swimming – the fact he was able to do it! “If you told me from the outset what we would do, I would have said no,” said Rob, who plays the lead role of Eric in the new British comedy film Swimming With Men. “The Wilting Flower and the Loop were hard. Being held under the water with someone’s feet around your neck and then your feet around someone else was pretty scary. The challenge was when to take a breath before going under. You’re under there thinking ‘come on, get a move on’. “And trying to remember the sequence. It’s like dancing and remembering the moves. You get there if you have enough time and we did – just about. “But you look at what we do and then look at the women in the Olympics. What they do defies physics. They are astonishingly good. “People do not appreciate how difficult it really is. “We did a thing for Sport Relief that was hard – really hard. We thought they would rehash something from the film but Adele [from Aquabatix] got ambitious and we had one day to shoot it. It was a real challenge – it was actually harder than the film. For Rob, there was one particular synchro routine that proved trickier than others. “I never mastered the Eggbeater,” he said. “That was the hardest thing but I never mastered it. It’s fiendishly difficult. “It’s described in the film as a ‘Ronaldo stepover in reverse’. I know less about football than I do about synchronised swimming but basically your legs are almost 90 degrees to the water and then your legs bend at the knee and it’s like a egg whisk or beater. Swimming With Men is based on a based on the real-life story of a team of Swedish synchronised swimmers and their bid to compete in the World Championships. Their journey was originally featured in the documentary Men Who Swim. All the Swimming With Men cast took part in an intense two-week boot camp to learn the routines – and Gavin and Stacey star Rob said the filming helped him to lose weight and become a stronger swimmer. “The script said Eric was a strong swimmer and that was not me at all so I had to learn how to do that,” said Rob. “I have always loved the water and been comfortable in it. “But I had no technique. I had a great teacher who did me a nice stroke so I have taken that away from the experience. “The film has made me a stronger swimmer but I certainly won’t be going to Tokyo! It’s a fantastic exercise if you’re doing it properly and that’s what I have learned. “I used to hear swimming was a great exercise but not the way I was doing it! Now I have had lessons, I can feel the benefits of what it’s doing to my muscles. It’s brilliant for general fitness and stamina. “I must have lost four or five pounds. I became more toned and I got into a nice shape. You notice it as you are using all the different muscles and you’re doing all this aerobics in between. Rob’s character uses swimming as a way to escape the everyday stresses that life has thrown at him – and he ends up joining the synchronised swimming team that travels to Milan to take part in the world championships. “Eric takes solace in the swimming pool and is under the water and feels cushioned from his life,” said Rob. “He meets this group of men and each of them, for whatever reason, are slightly out of sorts. “Being in this team gives them something interesting to look forward to. Eric awkwardly and hesitantly goes into that group and, for him, getting to know them was quite a thing. “I remember getting an immersive feeling, almost womb like, when being in the water and you would long for that feeling. Swimming With Men has also ensured Rob has a few party tricks to show off when on holiday. “I’ve got a few synchro moves I can get out now and again,” he laughed. “I did try to show some moves when I was on holiday last year but you need all the gear on – if you try it without a nose clip on, you come up coughing and spluttering. “I wonder if the film will lead to more people trying it. People have told me the film is quite touching. This vulnerable man having to work as part of a team with a lot of physical contact which men can be quite wary of. So who would Rob choose as a synchro duet partner? Rob Brydon said it would be an easy decision if he had to choose a synchro duet partner from the cast of Swimming With Men. “As far as I can remember, no-one stood out as being ‘wow, they’re amazing,” said Rob. “But if I had to pick one, I would go with Jim Cater [who plays Ted].